Today is the last day Oregonians can register to vote in the 2016 election! If you haven’t registered, do so here. OSEIA has done some research and we want to share results with you as you consider your votes. The 2017 legislative session has a lot of important topics to discuss. Many topics will impact the solar industry in Oregon and beyond like the Residential Energy Tax Credit (RETC) (set to expire at the end of 2017) and Property Tax Exemption (also set to expire end of 2017). While the Oregon solar industry is growing, it isn’t quite ready to stand alone without support. The Oregon SolarPAC has been busy across Oregon raising and dispensing of funds. While fundraising has been slower than hoped for, the funds raised thus far have been put to good use, and many of our members can testify to that! OSEIA Executive Director, Jeff Bissonnette and OSEIA members have met with 7 legislators so far to discuss solar in Oregon. These meetings have occurred in The Dalles, Eugene, Portland, Hillsboro, Salem, Cannon Beach, and Hood River. Legislators who are members of committees that deal with energy issues have been the key recipients of Oregon SolarPAC funds and they have been interested in hearing about the industry’s 2017 issues. If we had a bit more money, we could make a few other key donations. 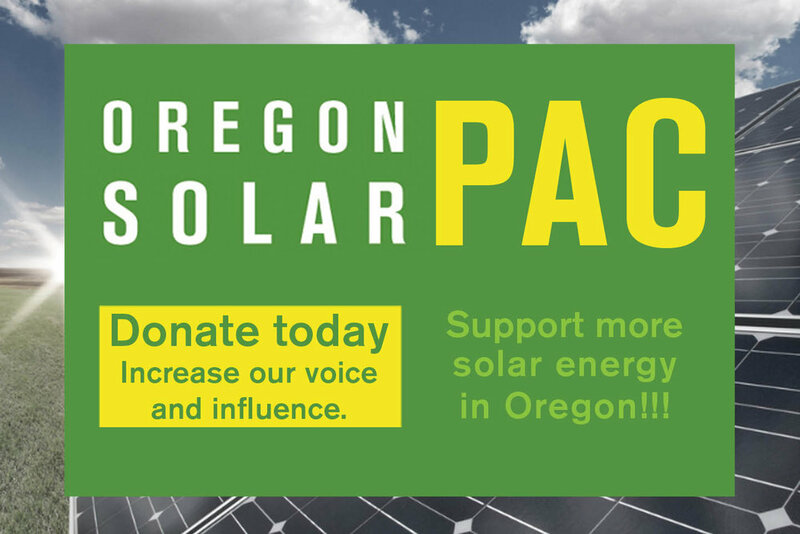 If you haven’t given to Oregon SolarPAC yet, you can make a contribution here. And the Oregon Political Tax Credit makes a $50 contribution free to you! OSEIA wanted to survey legislators directly deciding the outcome of the solar policy that affects our industry. Initial responses indicate positive support. Do you support an extension of the Residential Energy Tax Credit (RETC)? Do you support an extension of the property tax exemption for solar and other renewable resources (ORS 307.175)? Would you support an incentive for commercial solar (projects larger than those on a residential roof, smaller than utility scale, roughly 25kw - 500kw)? The 2017 legislative session is going to be critical for protecting the existing infrastructure we have to support solar in all its forms in Oregon. Solar professionals across the state will be needed to make sure we don’t take any steps back. Ask the questions you want the answers to, find your legislators here. And mark your calendar for Tuesday, April 18, 2017! That will be Solar Lobby Day for the session and we’ll need a big turn-out! Stay tuned and go solar!